Yesterday there were hearings before the Senate Banking Committee with the chairmen of the Securities and Exchange Commission and the Commodity Futures Trading Commission on crypto currencies, distributed ledger technology (blockchain), and initial coin offerings. If you do a quick browse of the subject through the news tab on Google (I used "bitcoin congress" as my search string), the theme you get from reading the headlines is "here come the regulators, Bitcoin is doomed," "regulators to seek more power over Bitcoin," basically several variations of, "they're about to shut it all down." 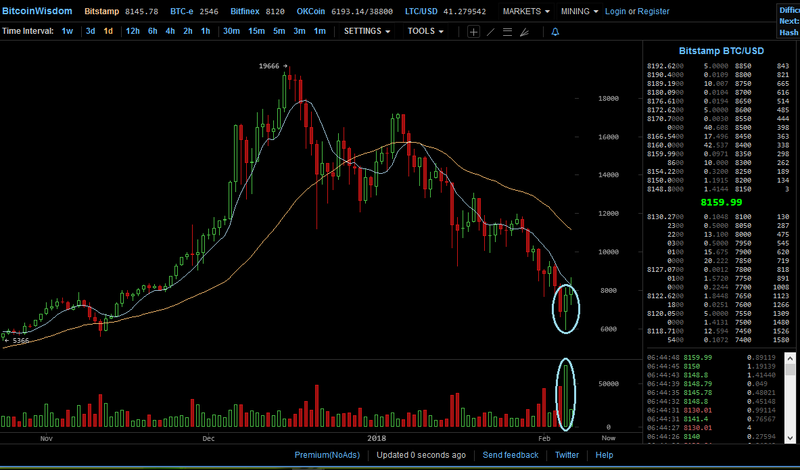 The two things I've highlighted on this chart may indicate that the Bitcoin market found its bottom. 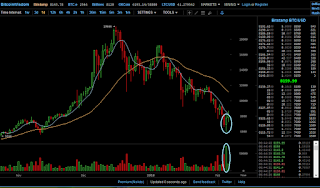 The top circle highlights a candle that resembles a "hammer," and the bottom circle highlights the corresponding spike in trade volume. These two things combined could indicate that a trend reversal is coming, as the combination suggests that bulls are getting back into the action and are gaining strength. Time will tell.